ghd made a splash as the first electrical brand to pop up at Colour World, providing styling stations for every colourist taking to the stage at the event. Colour World, which celebrates all aspects of being a professional hair colourist, is a renowned platform for creating spectacular colour – and what better complement to brilliant shades than perfect styling? ghd stylers promise ‘kinder to colour’ results, thanks to their optimum styling temperature of 185°C. Developed by scientists at their Cambridge lab, this optimum heat is proven to provide 2x more colour integrity† , for shades that stay true to tone and look picture perfect on camera. Over the course of the two-day event, ghd’s styling stations played host to stars from Not Another Salon, Joico ambassador Larisa Love and even men’s hairdressers from Sid Sottung Academy. 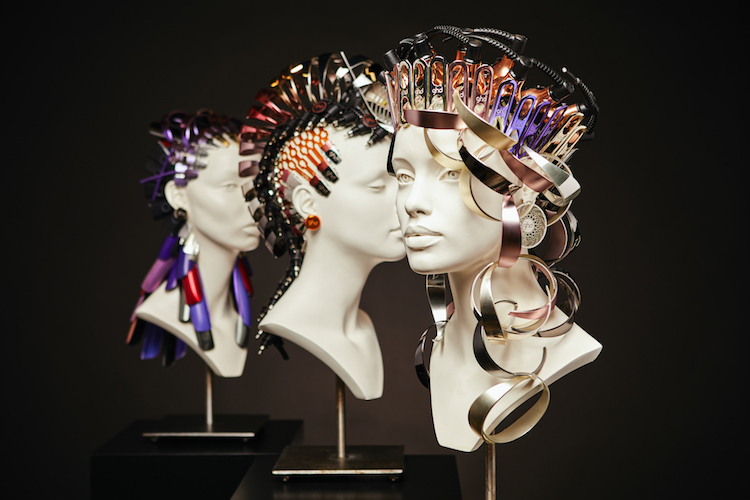 Providing an extra draw at the ghd stand were three sculptures, crafted entirely from components of ghd tools (above). The sculptures depicted three trends for summer 2018 – a halo braid, an embellished ponytail and slicked-back waves – all created with elements, hinges, cables and more from ghd favourites including the Air, Platinum and Gold. Visitors that snapped and tagged the statues on social media were able to bag a free ghd UV Heat Protect Spray, with more than 100 being given away over two days.